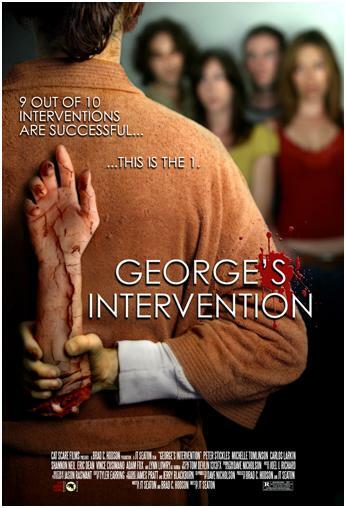 George's friends have all gathered for an intervention... George's intervention. You see, George is a zombie and his friends have come to realise that he has been snacking on his neighbours. They attempt to convince him to stop eating people and to enter 'zombie rehab'. But the intervention doesn't go quite as planned, and George’s monstrous appetite gets the better of him. Blood, mayhem and innards – lots of innards – ensue, as George’s friends, various gatecrashers, door-to-door salesmen, Mormons and strippers all end up on the menu. Ever wonder what happened to the likes of Ed from Shaun of the Dead, Bub from Day of the Dead or Colin from, well, Colin – zombies who somehow retained an element of what it was that made them human – after the credits rolled? What if a zombie was able to retain all of their personality, and everything that made them who they were as a person while they were alive? That is precisely the angle this satirical and bitingly witty comedy approaches its subject matter from. Zombism is essentially a ‘disease’, much like alcoholism, and zombies are now a normal part of society. These zombies however, are sentinel, self aware people – albeit people who are treated with quiet caution by most other people. A crudely animated cartoon in the style of an old school educational programme informs us of the now common place zombies have attained in society. After a bizarre star was seen in the sky, weird spores appeared on earth and were unknowingly breathed in by the populace. Appearing fairly harmless, it was only after people died that the full effect of the dormant spores was discovered. The spores reactivate dead tissue. In this world the living and the dead exist side by side and, the dead – with the exception of an aversion to sunlight and the occasional pang for human flesh - more or less go about their daily existence as everyone else does. They even have jobs and friends and families. Occasionally however, some zombies can’t, or won’t, abstain from following their gut instincts to feast on the flesh of the living. This soon becomes the case with affable slacker zombie George, whose best friend Ben (Peter Strickles), overbearing sister Francine (Shannon Hodson), ex-girlfriend Sarah (Michelle Tomlinson) and her new boyfriend Steve (Eric Dean), come to realise he has been having problems adapting to his new lifestyle (deadstyle?). Content to while away the hours lounging around his apartment watching gory movies and TV shows depicting gruesome injuries, George is unable to stop himself from snacking on the occasional neighbour who drops by. A mainly dialogue/character driven film, George’s Intervention shuffles along amicably, content to allow us to enjoy the company of its cast of quirky characters, before George’s appetite gets the better of him and he starts chewing them up, one by one, in increasingly bloody fashion. The splashy red effects are obviously of the low budget variety, but the film exudes so much charm and demented sweetness, it’s hard to fault it on its lack of budget. It more than compensates with its wit, humour and imagination. The strong ensemble cast, consisting of several cult/genre veterans including Lynn Lowry (I Drink Your Blood, The Crazies, They Came From Within/Shivers) as Barbra, a not very helpful professional interventionist and cameos from the likes of Brinke Stevens (Slumber Party Massacre, Body Double) and Lloyd Kaufman, treat the subject matter with just the right amount of tongue in cheekiness. They fling themselves into portraying their quirky characters, with noticeable relish and their exuberance is infectious. As the eponymous protagonist, Carlos Larkin delivers an irresistibly droll performance. Shuffling around in his bathrobe and slippers, with his hair in bunches; he seems more like a benevolent stoner than a flesh hungry zombie. Much of the film’s charm is derived from his dryly manic, Bill Murray-esque performance. The more familiar imagery associated with zombie flicks comes later on when the butchered cast members return as zombies. We also discover that it is the zombies with head trauma who are the really dangerous ones – so shooting zombies in the head won’t resolve a sticky situation as it does in most other zombie-saturated situations – as these guys find out – it only makes matters much worse. Chuck in some nifty ideas like Tofu flesh, zombie tech support hotlines and ZA meetings, and you have yourself one highly enjoyable, zany and eventually, one very wet and red zombie comedy, with a lot of brains and heart. Sorry – couldn’t resist. George's Intervention is set to have its UK Premiere at the 2nd Yellow Fever Independent Film Festival in Belfast, 27th August. To book tickets for the screening, go here. And I love the poster! 'tis indeed a winner, Andrew. Isn't the poster great? Sums it all up perfectly. The GI guys were at the convention this year, I stopped by and dropped a card and was hoping to get to check out a screener sometime, they were still running around premiering the film in smaller clubs and venues, but it looked like a heap of fun and another new and interesting take on the familiar zombie genre! It is indeed a heap of fun, Carl! Hope you get to check it out soon. Low-budget goodness, and, like you say, an interesting take on the zombie genre.